Falmouth? Where the heck is that??? Well, that was our port-of-call in Jamaica for our cruise on the Allure of the Seas. Some quick research resulted in a decision to hire a driver to take us to Montego Bay instead. Essentially, RCCL built a shopping area in Falmouth since there was little there to begin with. 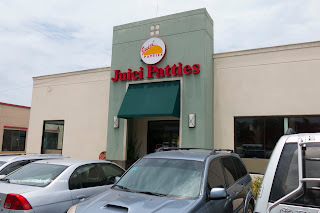 On our little tour of Montego Bay, I noticed a place called Juici Patties and insisted we stop to try some. Our driver ended up taking us to a "nicer" location where I stuck out like a sore thumb while lining up for my patties. Hey, there are Chinese Jamaicans! And actually I know a few of them too! But sadly, I didn't look anywhere remotely close to Chinese Jamaican as I tan as well as a white piece of paper. So I ended up getting 4 of patties including the ever popular Beef Patty. For roughly $1.50USD each, these were a fair size. The pastry was flaky and a touch drier than I'm normally used to but hey, this was Jamaican Patty in Jamaica. 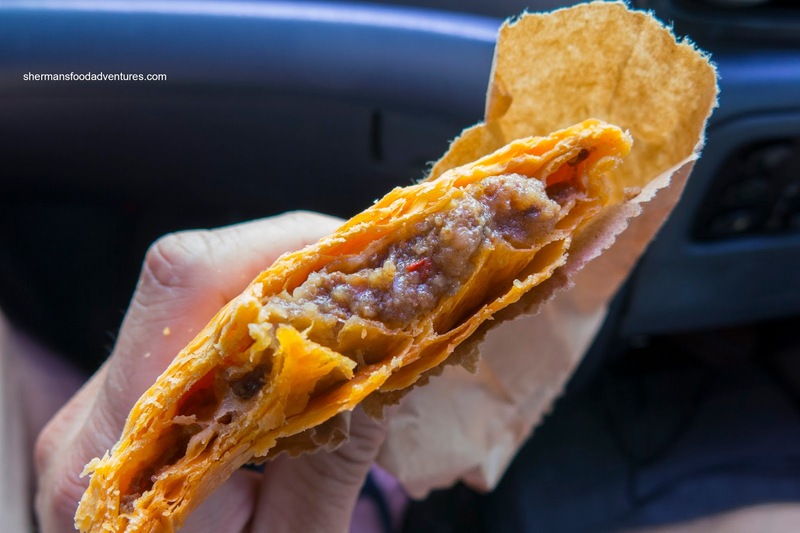 The filling was steaming hot and only slightly spicy. It was easy to eat and flavourful from the beef as well as the spices. This was both satisfying and messy as I covered the myself and the car with crumbs. Not being all that hungry, I was only able to sample one other patty from the 4 that I bought. Marked with a green dot, the Chicken Patty was of course equally flaky. On the other hand, the filling was lighter and creamier than the beef. It was also lacked the spiciness as well despite the curry hit. 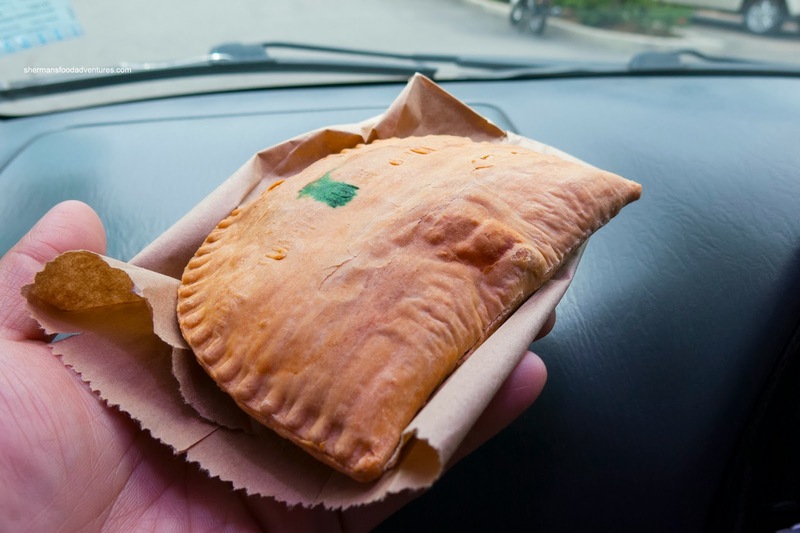 These were some pretty tasty and substantial patties that satisfied our cravings. Not mind-blowing, but definitely legit (duh... we were in Jamaica...). - They have a location in Toronto... how about Vancouver? There's The Patty Shop on MacDonald St. on the west side. Feels like they've been there forever (at least since the '90s when we lived in the 'hood). 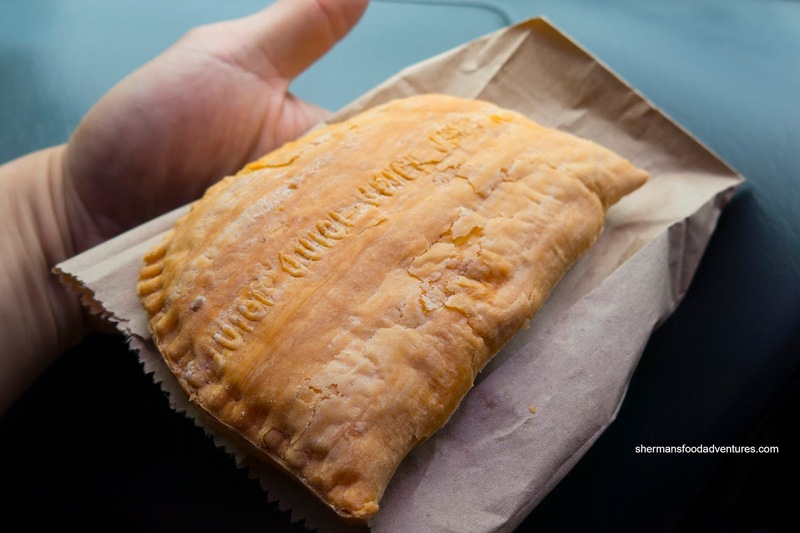 I'm not a big fan of Jamaican patties (crust I don't like much). Yah, the Patty Shop is my fav in town. They have fozen ones to take home and bake as well. I need to go do a revisit!